4/1/14 - 5/1/14 | sweet juniper! Hello all. Most of my blogging energy has been absorbed by another project for quite some time now. Otherwise things are pretty much the same here. I've really been enjoying the liberation that comes from never worrying about what the next blog post needs to be about and just making dozens of things that I haven't shared here. But if there are folks out there still interested, I may pop in from time to time to share a few of the things we've been up to. If there was one thing that got us through that winter, it was chapter books. We rearranged the shelves and boxed up hundreds of picture books and just started binging on more serious reads at bedtime and through those long cooped-up winter days. To all the parents of younger kids out there dedicated to reading those picture books to babies and toddlers every night, let me speak to you from your not-too-distant future: it gets so awesome when you finally put down the picture books and start sharing more demanding stories. That's especially true when you start tearing through your own favorite books from childhood, watching them in their beds painting their own pictures with those words coming from your lips. My wife has read them dozens of novels---new and old---at bedtime over the past few months. And I always end the night with poems to remind them that words can be beautiful even if they don't always make sense, so we've been on a steady diet of Hopkins and Frost and Yeats. My daughter's favorite book is Roald Dahl's The BFG, which I never read as a kid but she has now finished eight or nine times. It's about this massive-eared "Big Friendly Giant" who comes to kids windows at night and blows dreams into their ears with a long trumpet-like horn. For a girl who has always had some anxiety about sleep, there seems to be comfort in the story of a goofball giant who brings sweet dreams and banishes nightmares and who farts (whizpops) a lot after drinking his favorite drink (frobscottle) and speaks in a hilariously confused English. 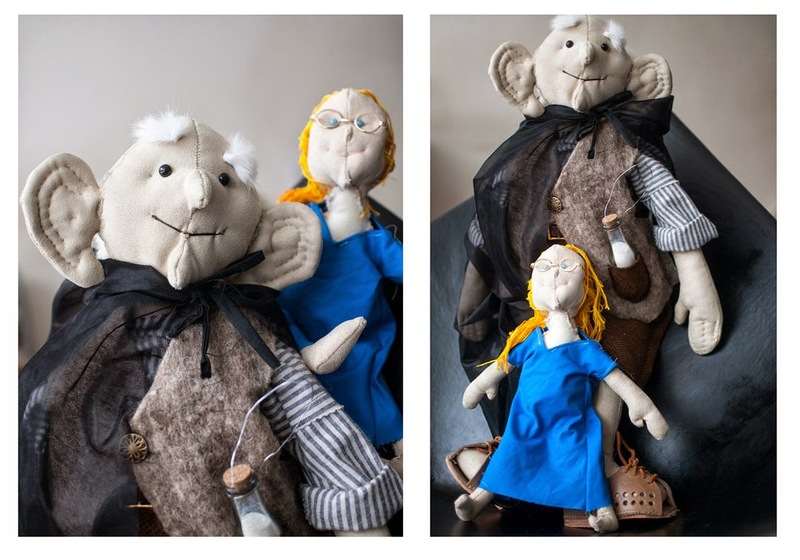 For her birthday I decided to make her a BFG doll for her bed just to make sure she always has good dreams. I did some research about how dolls are made and taught myself to use my wife's sewing machine, and it took a great deal of courage to overcome my fear of losing whatever shred of masculinity I had left. I think it all drifted away like silvery waves of gossamer while I crouched over that machine sewing pants for a naked bald-headed man doll. That black-hooded thing is the invisible cloak he wears while delivering dreams, which are kept in a little glass bottle in his pocket (I used glitter rather than actual dreams). Yes, I bought glitter to put in a dainty glass bottle. Why am I admitting this to the world? My favorite part are his sandals. There's a good story surrounding those sandals. 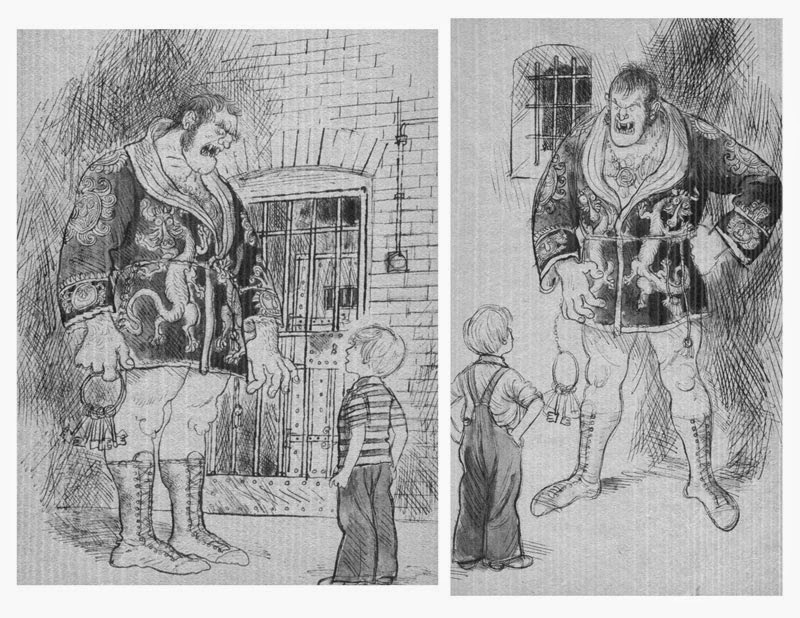 When Roald Dahl originally wrote the book, he described the BFG wearing tall black boots. When Quentin Blake did the original illustrations Dahl thought the boots made him look "too fierce." So for inspiration he sent Blake one of the actual Norwegian sandals that Dahl was known for. I imagine it smelled. 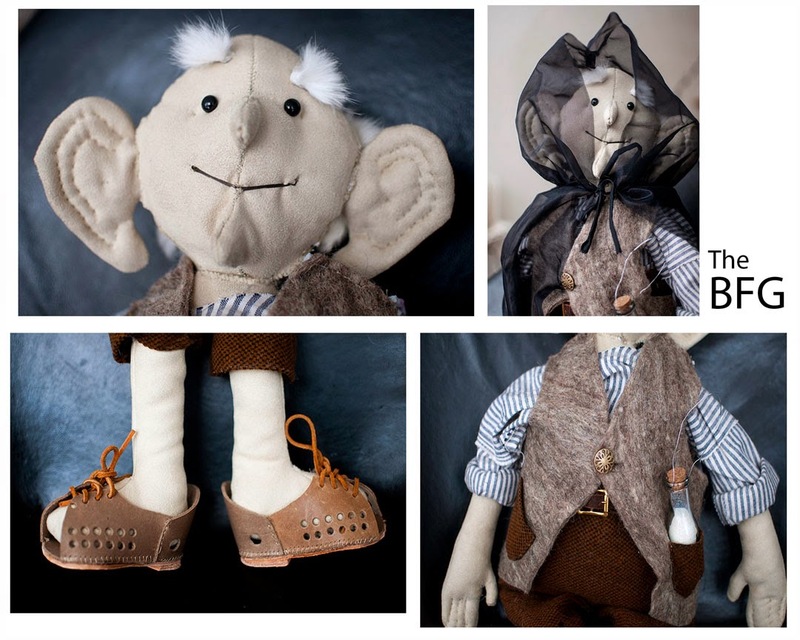 Dahl then changed the text, describing the BFG's footwear as, "a pair of ridiculous sandals that for some reason had holes cut along each side, with a large hole at the end where his toes stuck out." You can see the actual sandals at the Roald Dahl museum. I cobbled mine together out of scrap leather. The doll was a massive hit with the birthday girl. 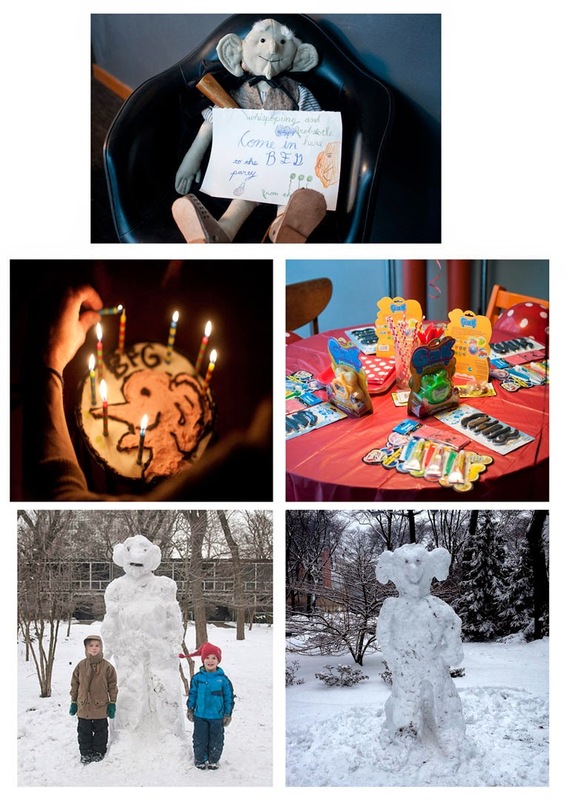 He even greeted a few friends she invited over for a simple BFG-themed birthday party. We made snow BFGs outside to surprise the guests and just let everyone run around with whoopee cushions, cucumb. . .I mean, snozzcumbers, and "frobscottle" they made from various fruit syrups they carbonated in our soda thing. I also made her a BFG cake. She did most of that work herself, including the dress. Without giving too much away, the Hooded Fang doesn't quite live up to his reputation and by the end of the book my son loved him very much. So I sat back down at the sewing machine and made him a Hooded Fang. Yeah. . . It was pretty awkward making that, even before I finished his silk wrestler's robe. 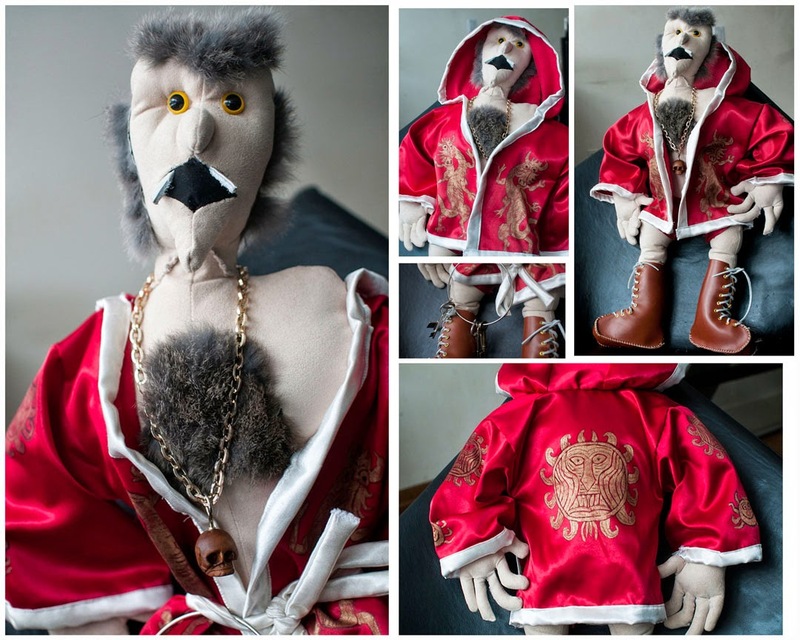 I basically made my son a doll who looks like the vampire attendant of a 1970s San Francisco bathhouse. Did I really want him sleeping with that thing? Sometimes I set him up so The Hooded Fang looks like he's watching him sleep, and the next morning I find that my son has knocked him down. But he still loves his Hooded Fang, even if he doesn't want him watching him sleep. I made his sideburns, hairy chest, and monobrow out of rabbit fur. The wrestling boots are real leather. I painstakingly painted the design on the red material from Wegner's original illustrations. He may be unnerving, but I'm pretty sure he's the only Hooded Fang doll on earth.